(This week is a guest post from my friend Jess. 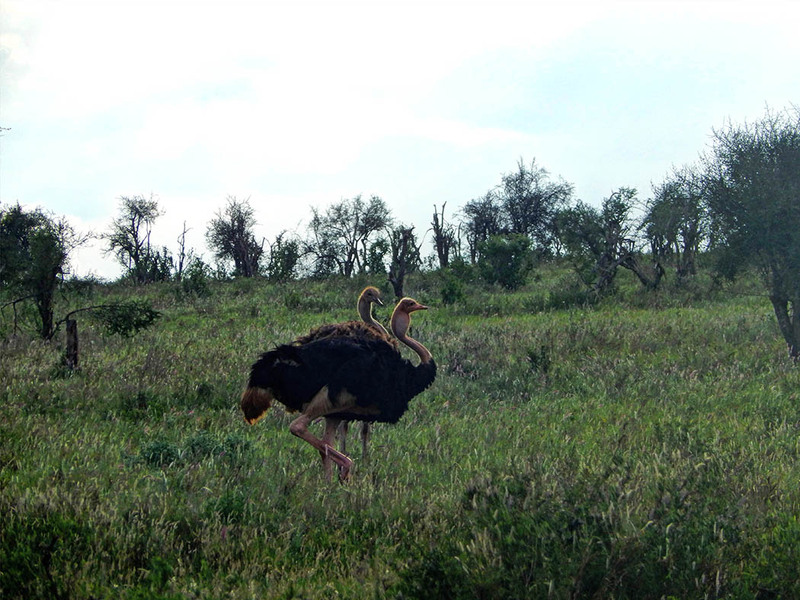 She gives an account of her visit to the Taita Hills Wildlife Sanctuary). 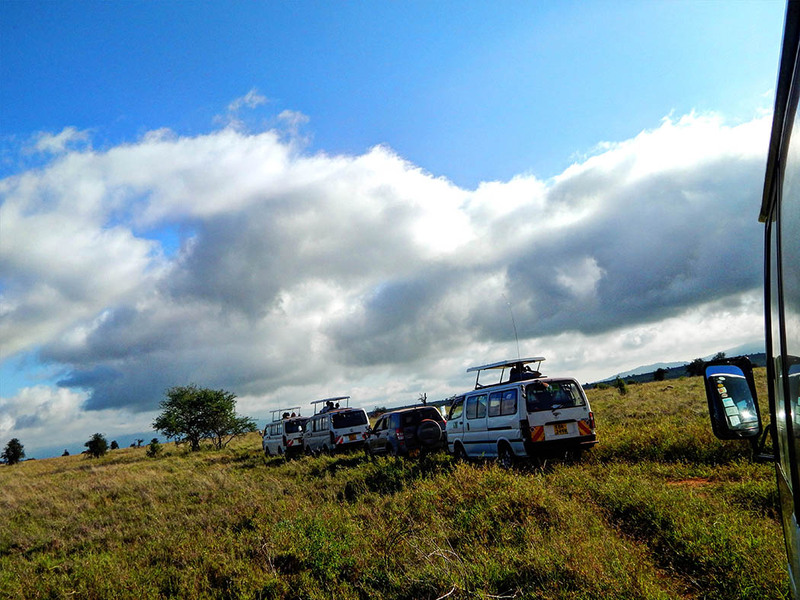 Taita Hills Wildlife Sanctuary is a privately owned sanctuary, located in Taita-Taveta in the south west region of Kenya. 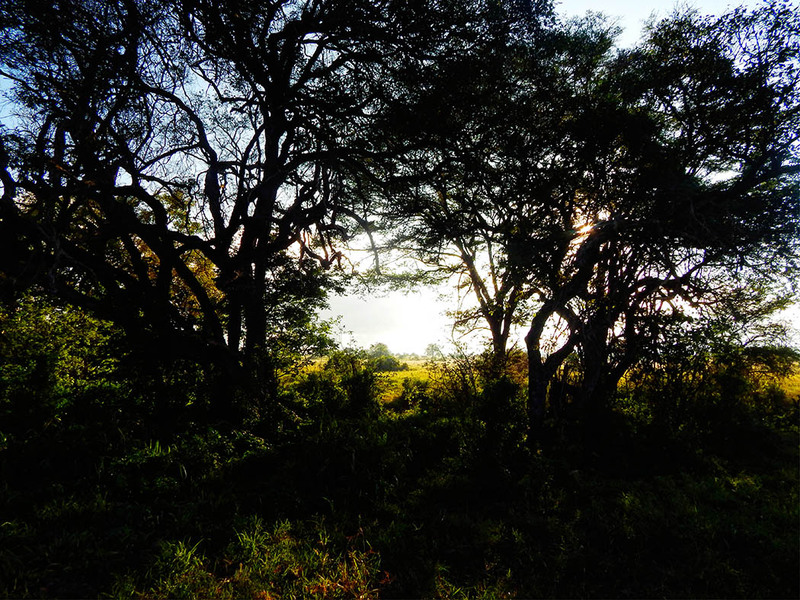 The sanctuary is majorly savanna with some few areas covered with bushes and thicket. 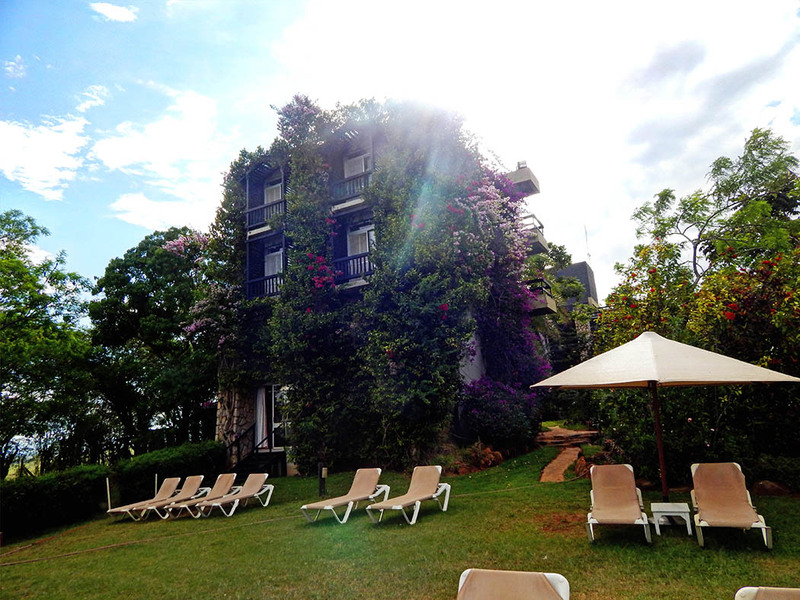 As the name suggests the sanctuary offers panoramic views of the neighboring Taita hills. 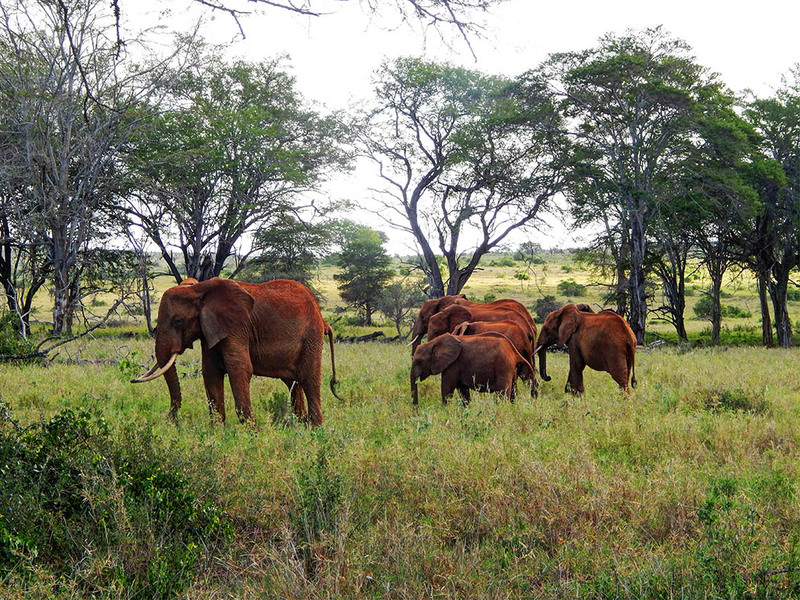 During my recent visit to the sanctuary I noticed that the number of animals seemed fewer. 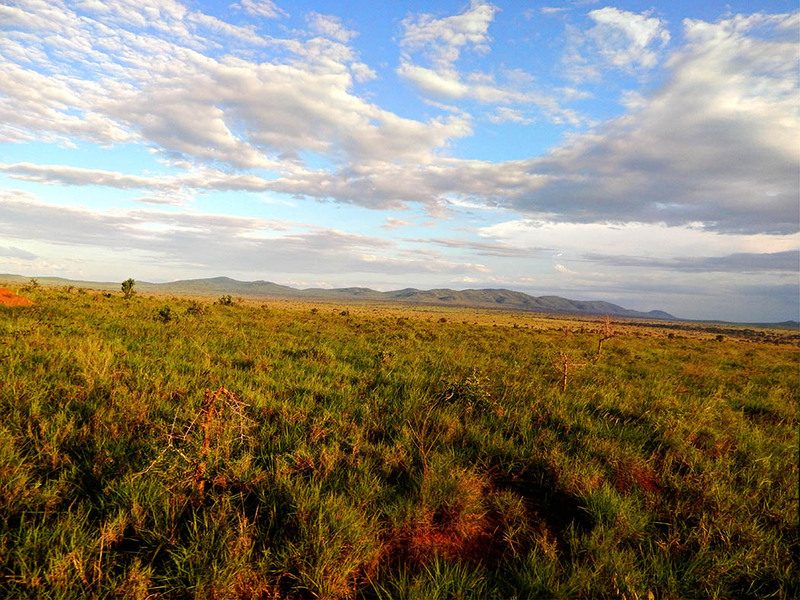 Our tour guide mentioned that since the sanctuary borders another conservancy and also is near Tsavo West National Park the animals randomly traverse the vast savanna in search of food and water. 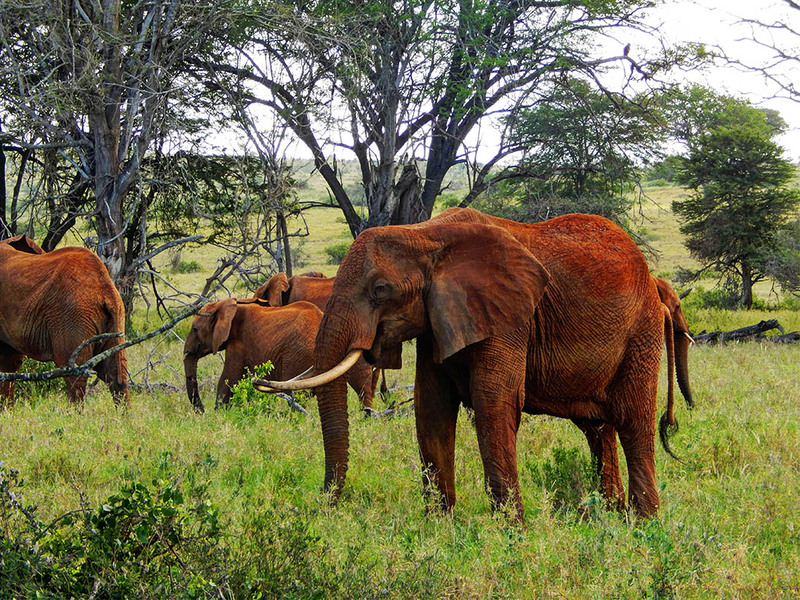 The numbers not withstanding we were able to sight the magnificent jumbos in their herds. Elephants are quite common in this sanctuary and can be easily spotted having a drink at the watering holes or busy browsing for food. 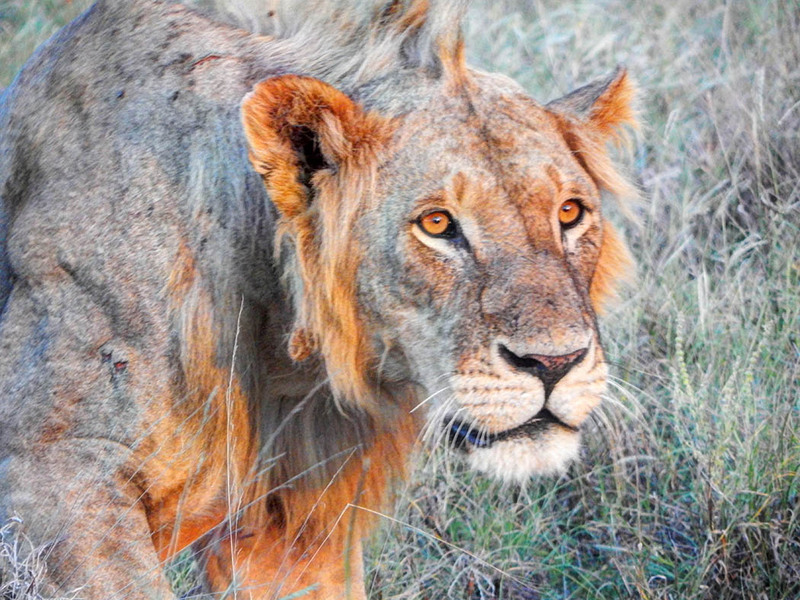 One thing I have observed during any game drive is the search of the king of the jungle -the lion. Actually to some people no game drive is complete until a lion is sighted. 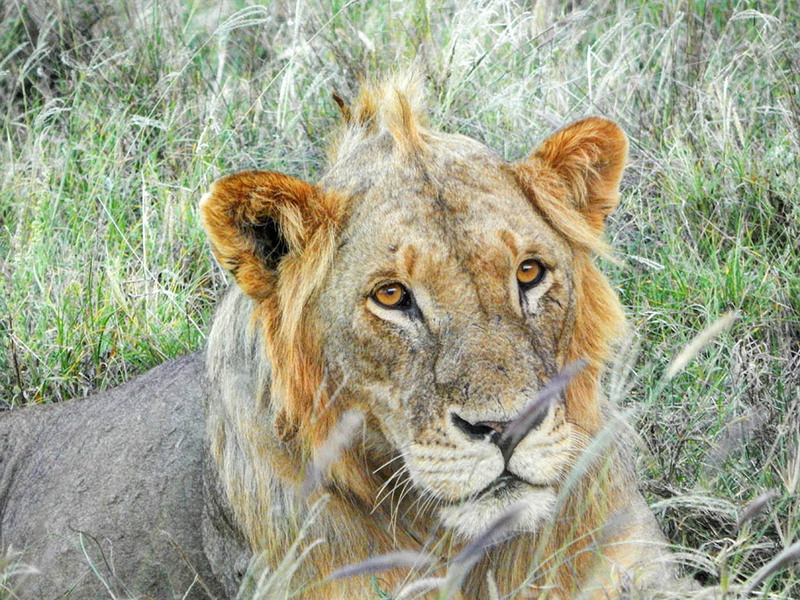 On this particular game drive we privileged to locate two lions- a lion and a lioness. 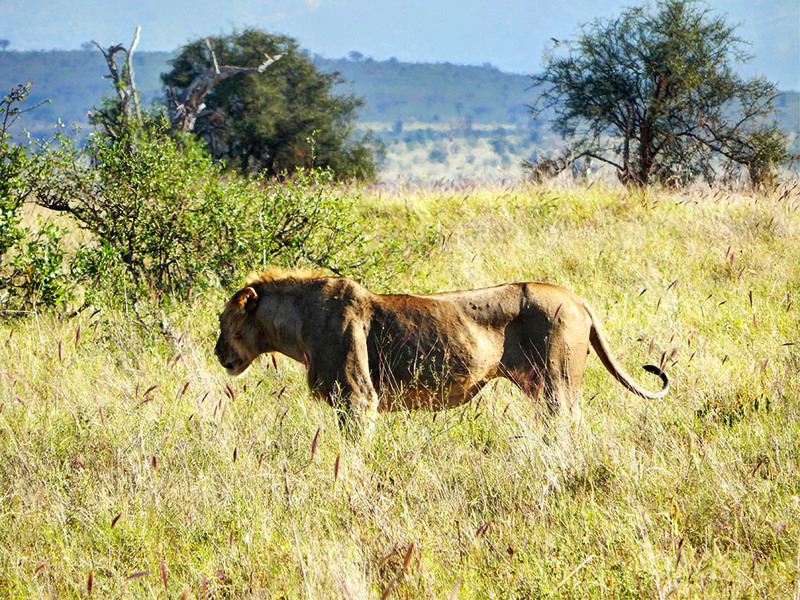 The excitement of spotting a lion is always preceded by the sight of many tour vehicles congregating in one single area. 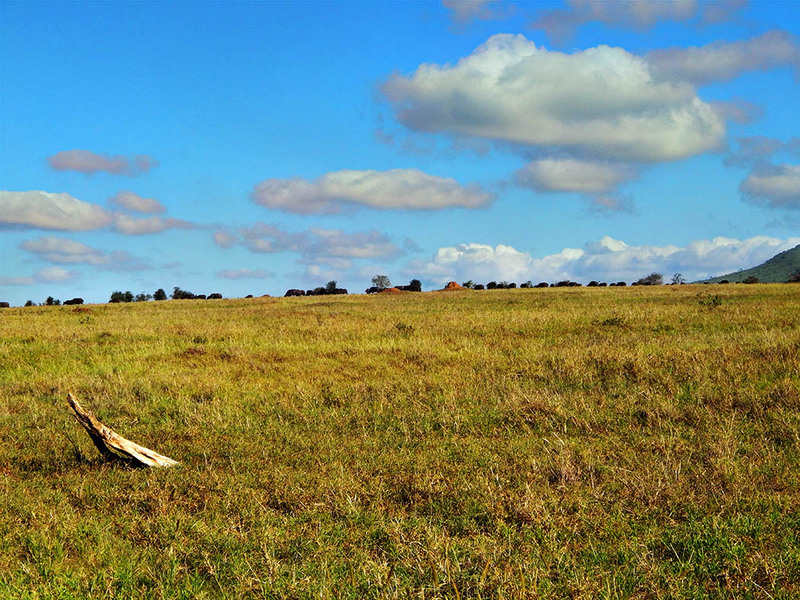 The thing is that if the lions are busy taking a siesta one can easily drive past them since the grasslands serves as a camouflage. The savanna discreetly conceals the sleeping cats. It so happened that this ‘couple’ was on ‘honeymoon’. 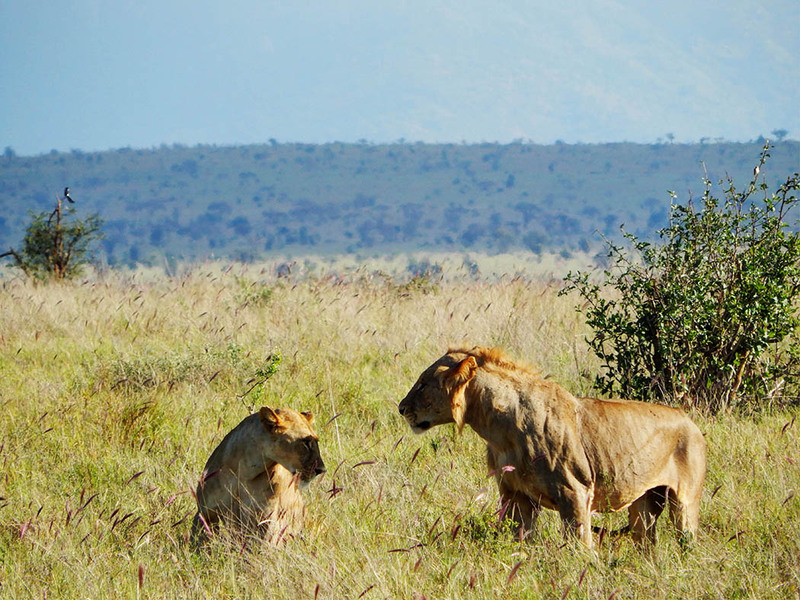 During mating season, lions normally retreat to a secluded area. 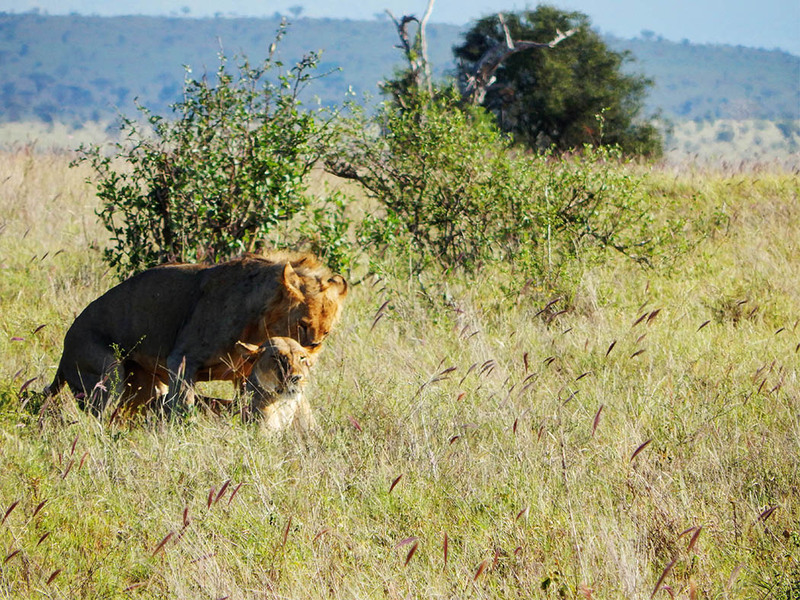 Our guide mentioned that the mating season normally lasts several days and the mating is pretty intense as lions copulate for about twenty to forty times in a day! talk of stamina. All the while having foregone food for that duration..
On a clear day one can also spot the snow capped Mt. 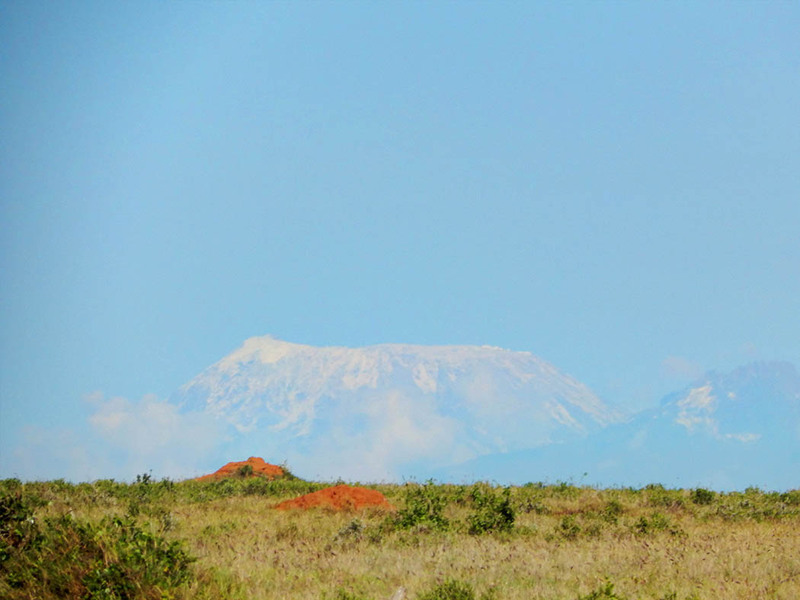 Kilimanjaro in neighboring Tanzania. 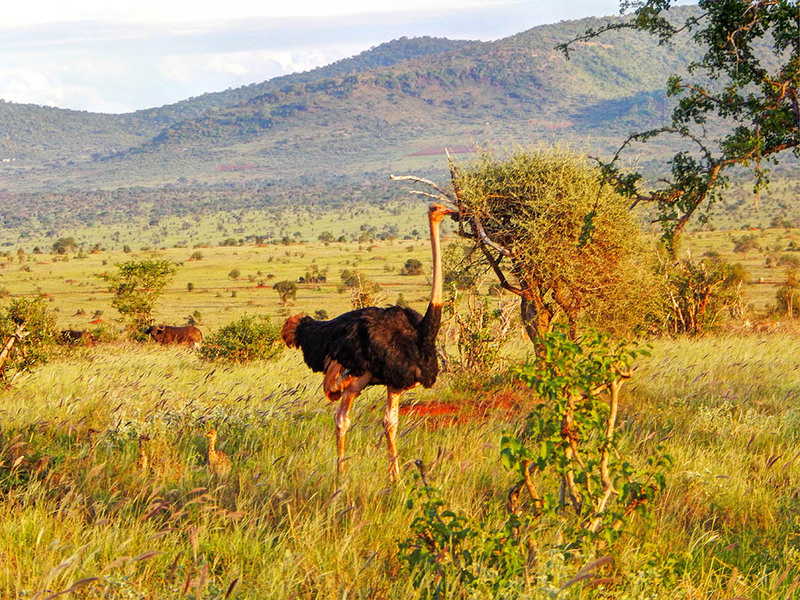 The male ostriches have black feathers while the female ostriches have brown feathers. 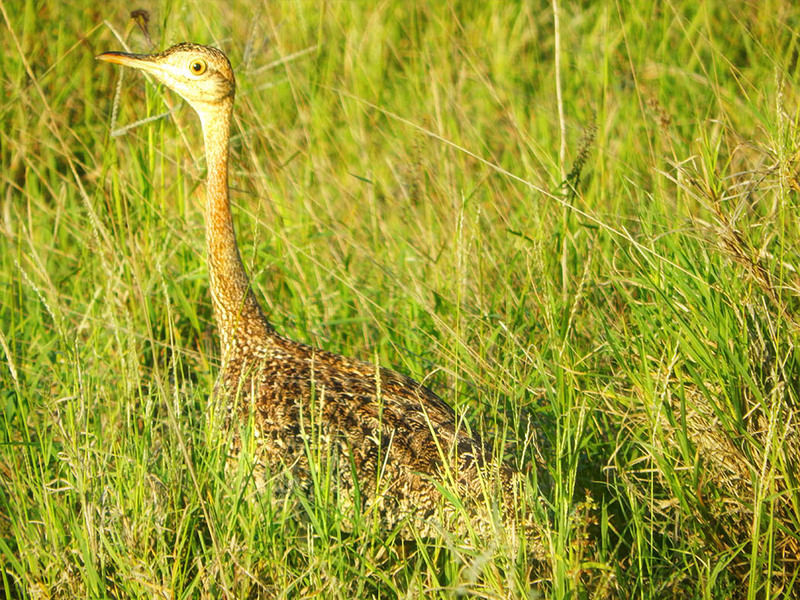 Ostriches are pretty fierce birds and very protective over their eggs. 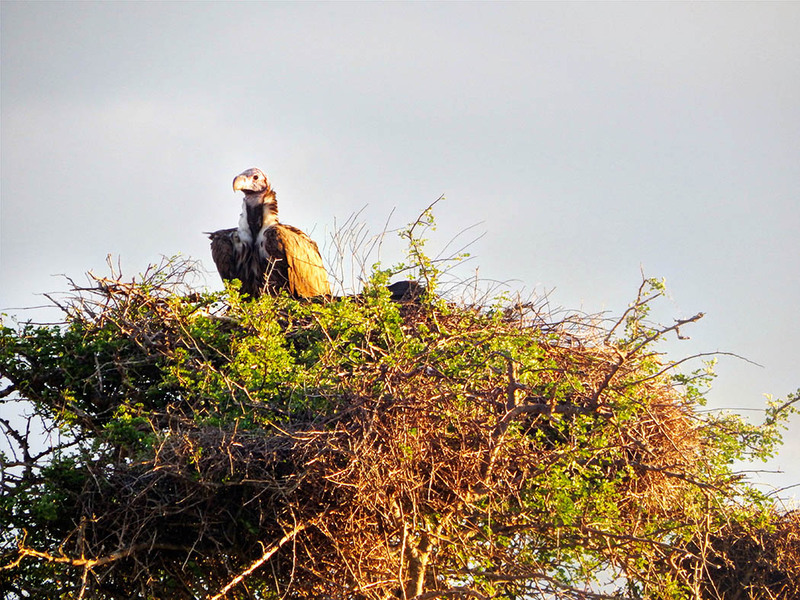 We also learnt that the male and female take turns to sit on the eggs as the other keeps watch. We also spotted the helmeted guinea fowls, which apparently can only be found south of the equator, the guinea fowls north of the equator have no helmets. 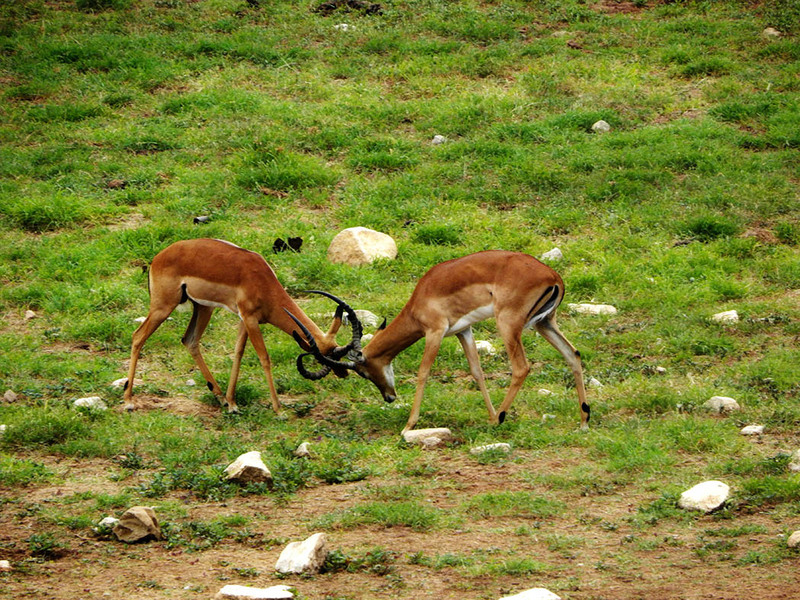 The sanctuary is home to different types of antelopes and gazelles. 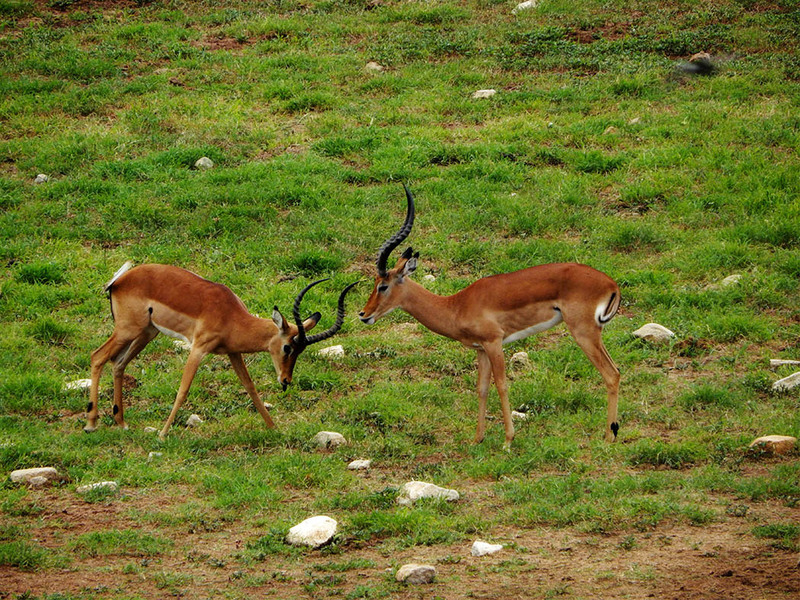 Did you know in the antelope family only the males have horns? 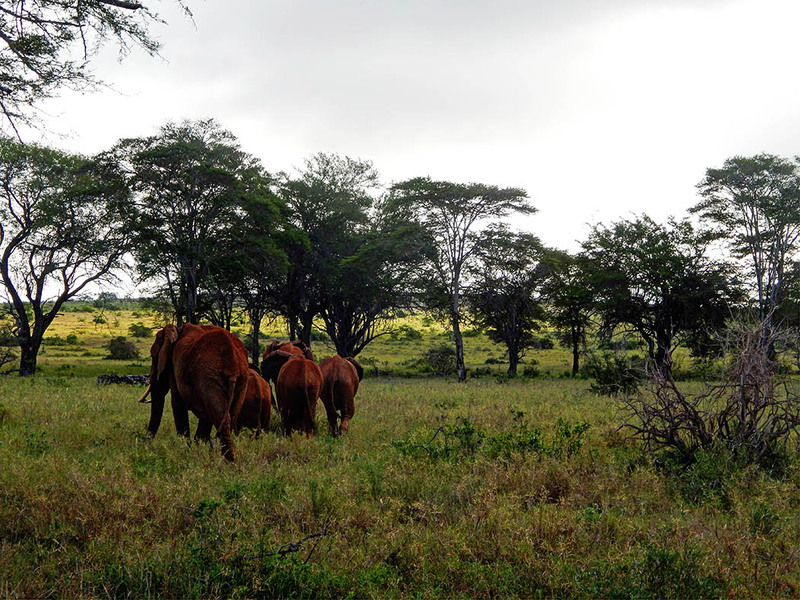 Cape buffaloes can also be spotted in large herds. 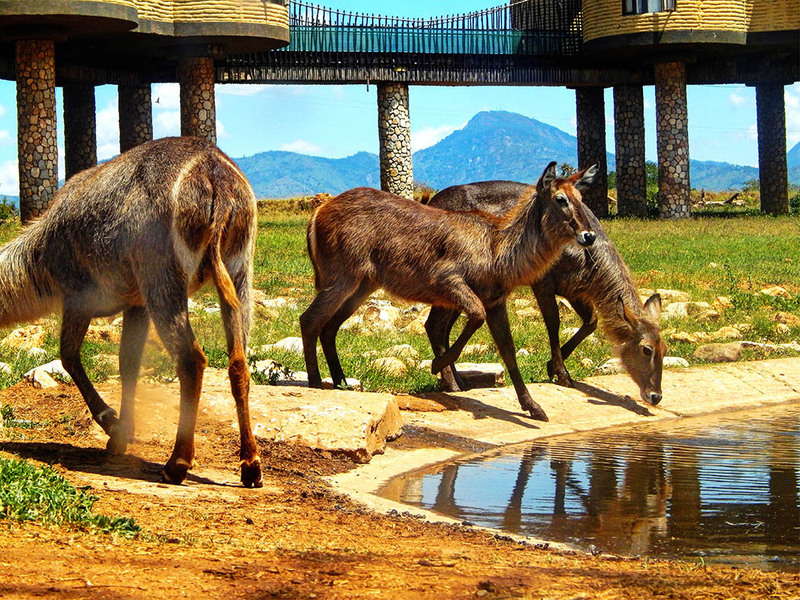 While visiting the sanctuary you can either chose to stay at the Sarova Taita Hills Game Lodge or at the Sarova Salt Lick Lodge. 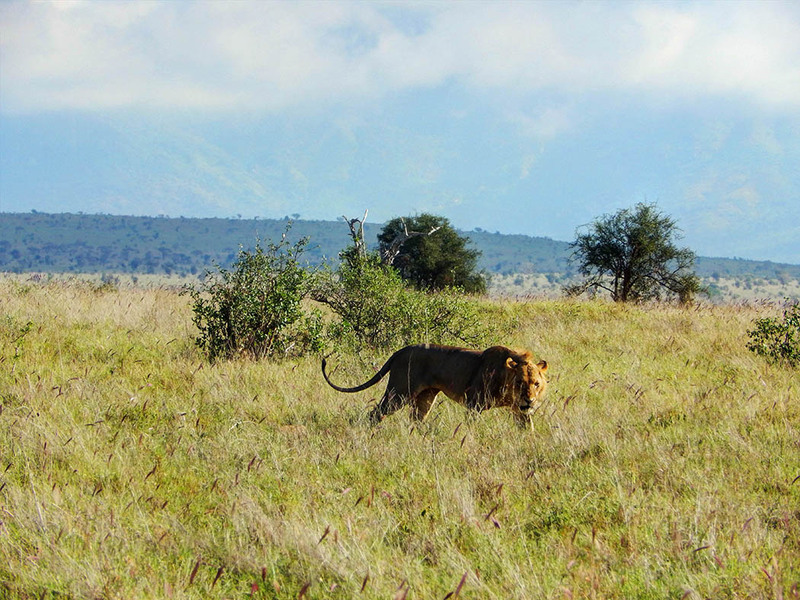 Both lodges are near watering holes which make for excellent wildlife viewing. 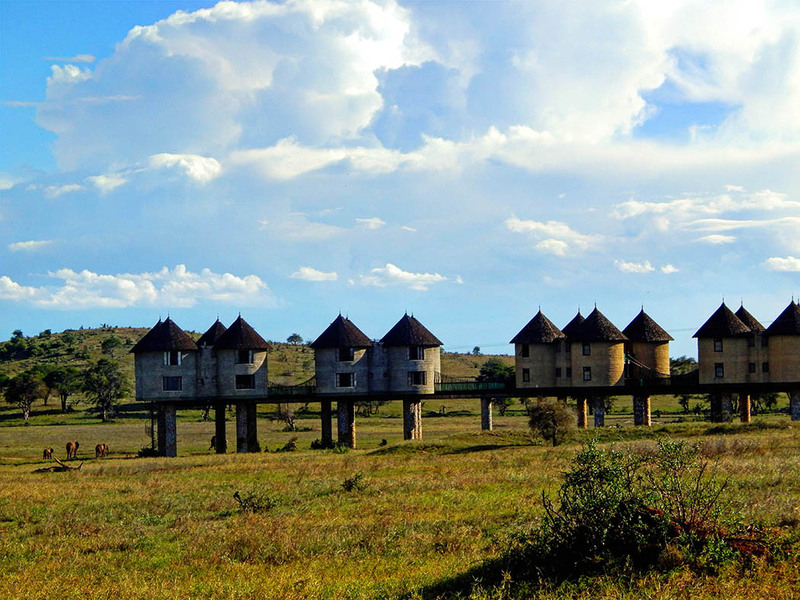 The Sarova Salt Lick game lodge is unique in that the rooms are built on stilts and thus offer amazing views of wildlife and the sanctuary. 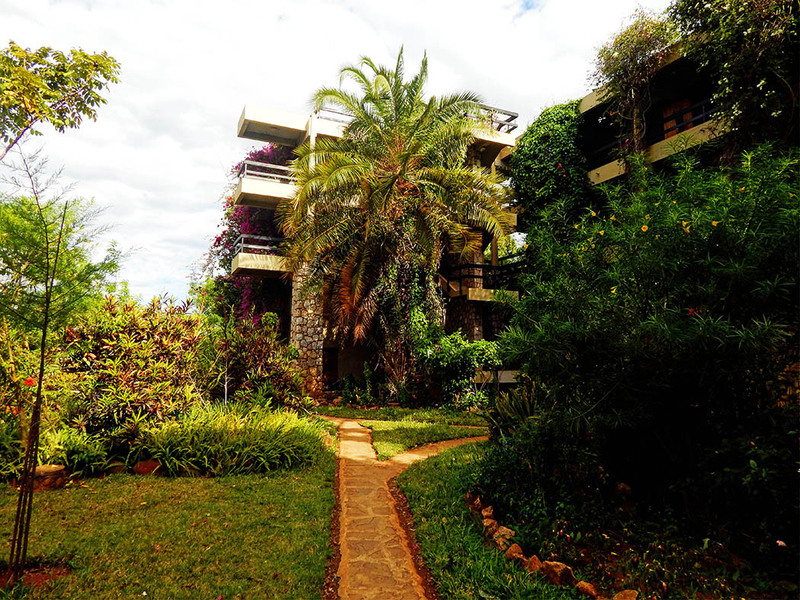 The lobby, restaurant and terraced bar all provide excellent views and photographic opportunities, while an underground tunnel and bunker with ground level windows provides unbelievably close yet safe access to a variety of wildlife as they drink. 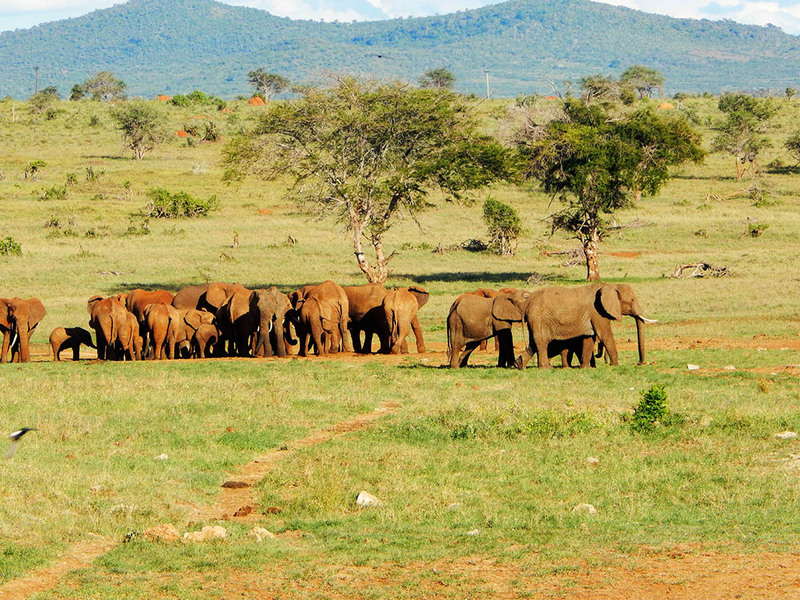 The sanctuary is easily accessible via the Nairobi – Mombasa highway and then branching off at the Taita -Taveta road. It is advisable to use of a travel company for both the hotel booking and easy facilitation of the tour in the Sanctuary. Corinne and Jim of Reflections Enroute, Margherita and Nick of TheCrowdedPlanet, Paula and Gordy of ContentedTraveller, Crystal and Francisco of BayEssence, and Rhonda Albom of AlbomAdventures. who are working hard to spread the word on what wonderful work travel bloggers are doing. Wow. This place is amazing. So vast and endless in the early photos and so filled with life in the animal ones. That lodges is pretty amazing too. 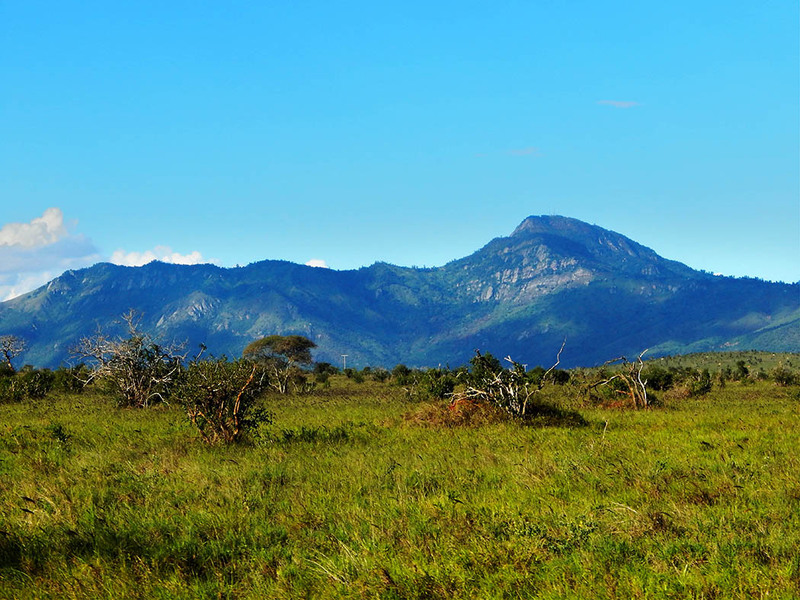 I am inspired, and Taita Hills Wildlife Sanctuary is now on my bucket list. Glad to be partnering with you on weekend travel inspiration. 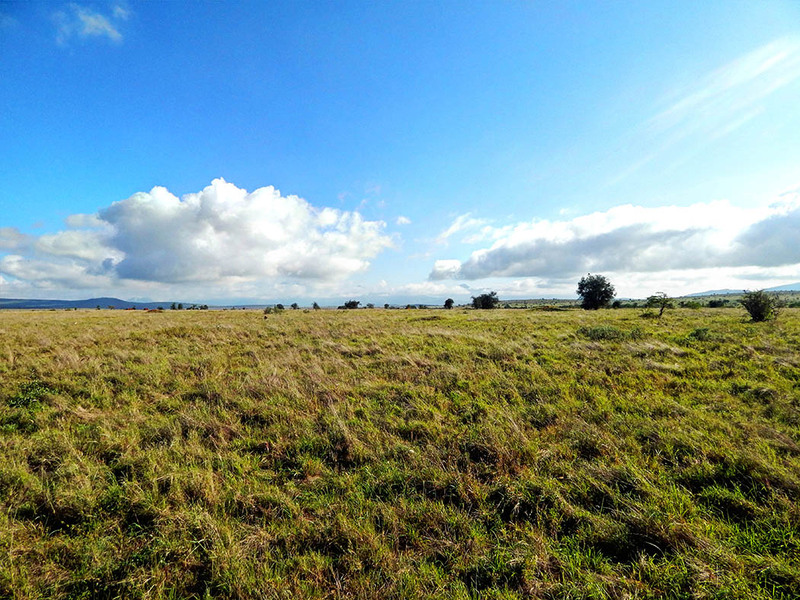 I enjoyed my virtual tour of the sanctuary through your stunning photos. 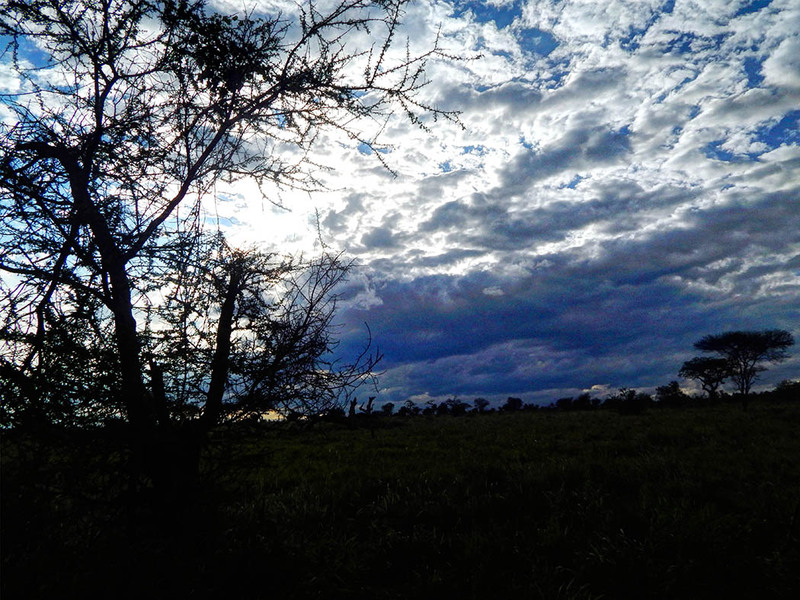 I love the amazing nature – the beautiful vegetation, the wide and beautiful variety of wildlife, the lovely sky, etc. 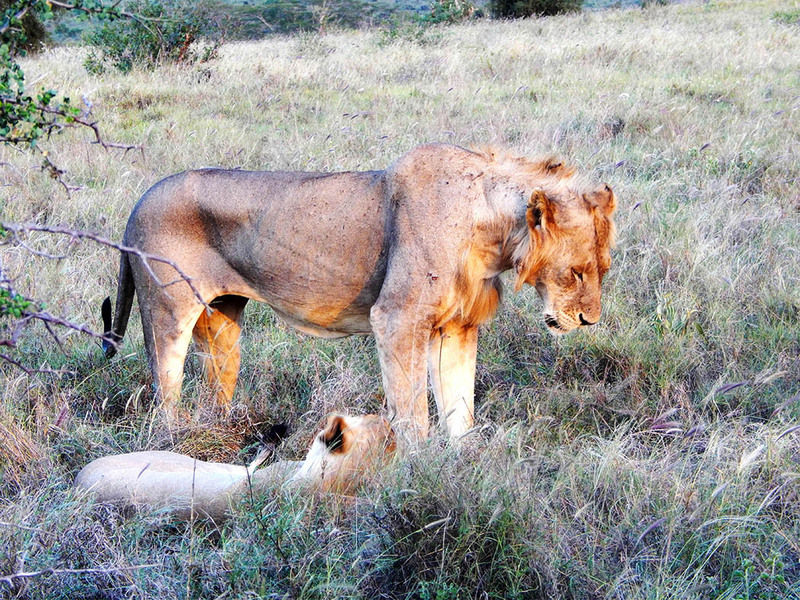 I’m fasciated with Sarova Salt lick Game Lodge. It looks very unique. I can just imagine the great vantage view of the wildlife and landscape from its rooms. Wow! This sanctuary is now on my list. I love the fact that you can go underground at the watering hole. 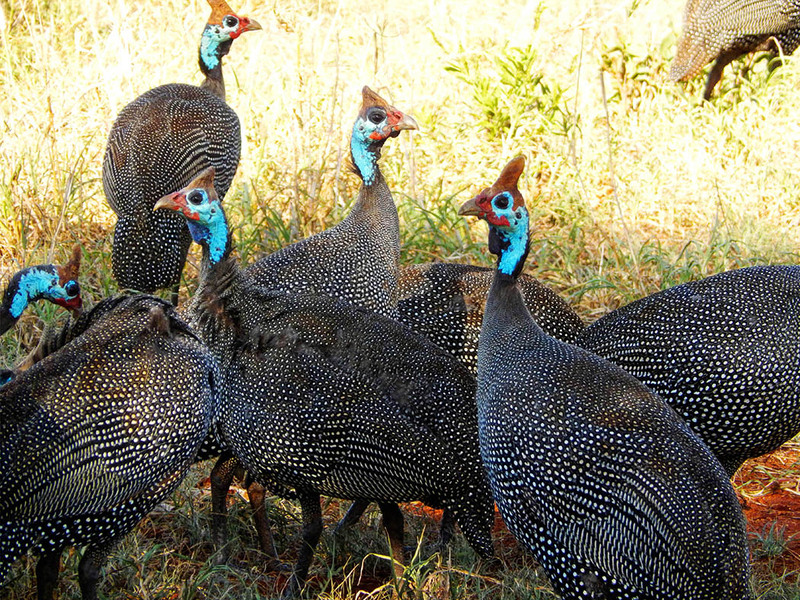 Also, my favorite photo is the guinea fowl. I’m always trying to get a good shot of them, and I’ve been unsuccessful! Yay! Weekend Travel Inspiration! 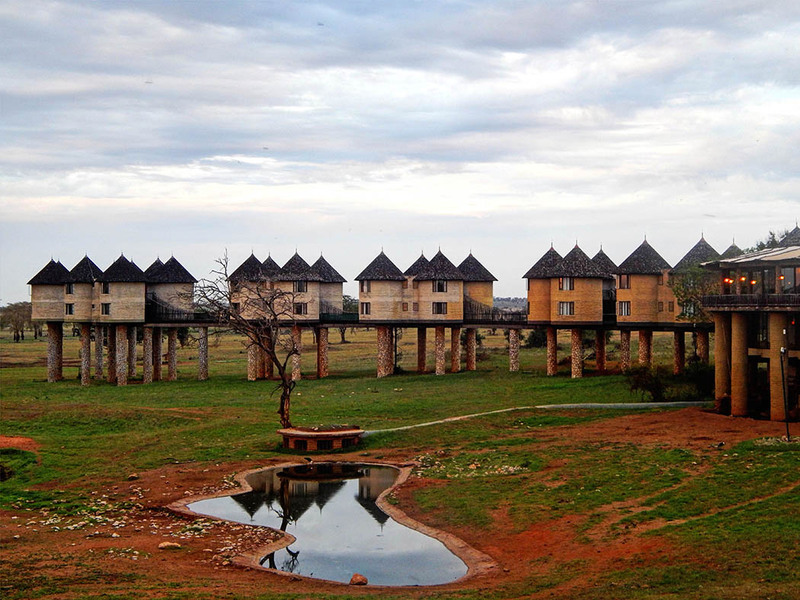 Great post, I have always seen pics of the Sarova Salt lick Game Lodge and thought it was located in one of the Tsavo’s. 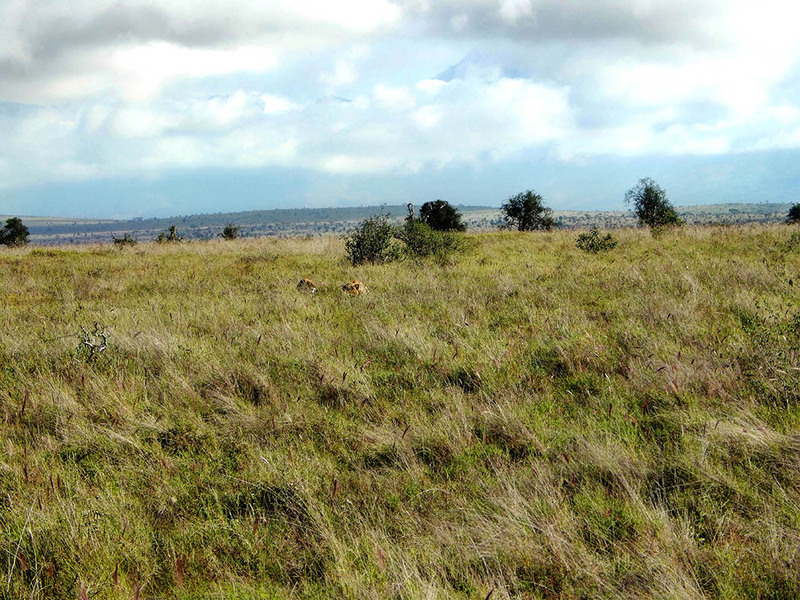 Btw, is that Mt kilimanjaro in the background in the lion camouflage pic (11th pic from the top)? Beautiful pictures! I love that the lodge is on stilts, and I also like the underground feature. It would be amazing to witness these animals in their natural habitat. Wonderful scenery and what a unique lodge! The photos make me almost feel like I’m there and could reach out and touch a honeymooning lion, although that probably wouldn’t be advisable in real life. I love how Mt. 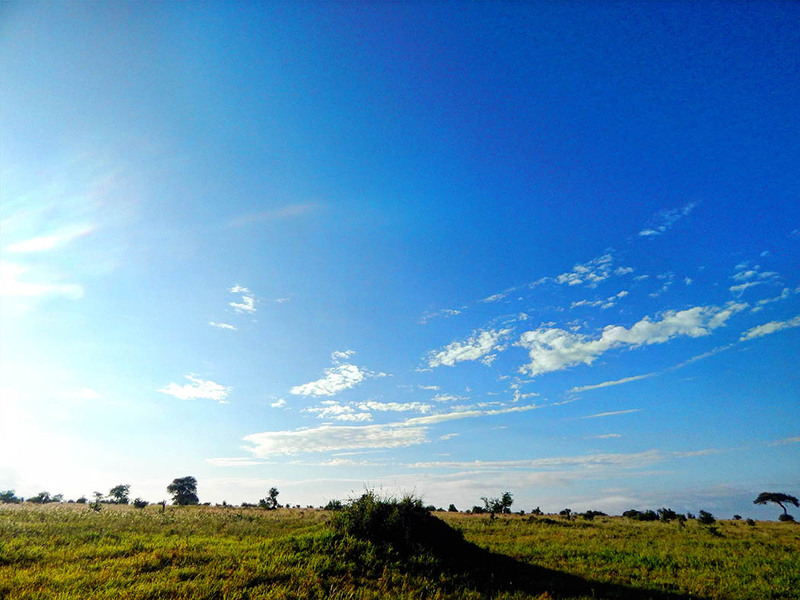 Kilimanjaro looks almost like it’s floating above the plains. 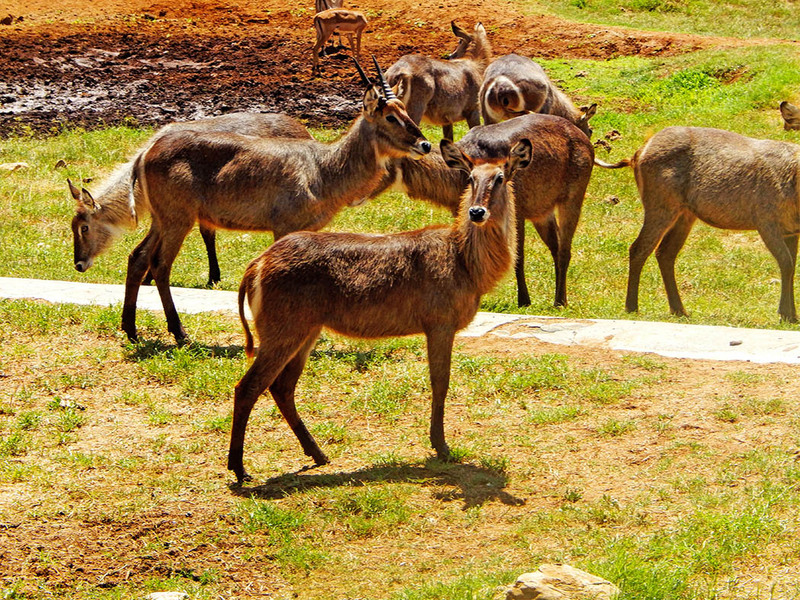 The Salt Lick lodge looks like a great way to enjoy watching wildlife without bumping around in a jeep. Wow, what an amazing place! 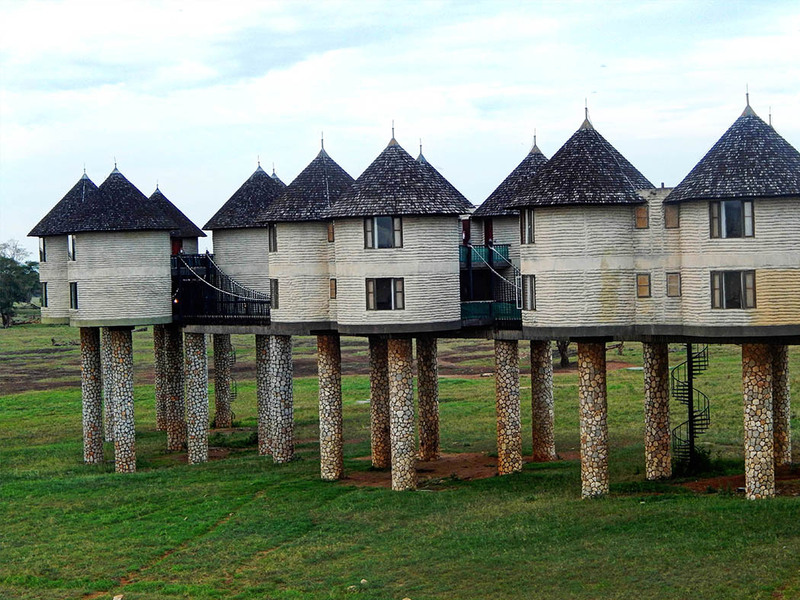 This is #wkendtraveninspiration indeed… loving the houses on stilts! and, of course, all that wonderful nature and wildlife. WOW! That was just an amazing virtual tour! Your photos especially of the wildlife are just stunning. This sanctuary is one I’d love to visit someday with the family. 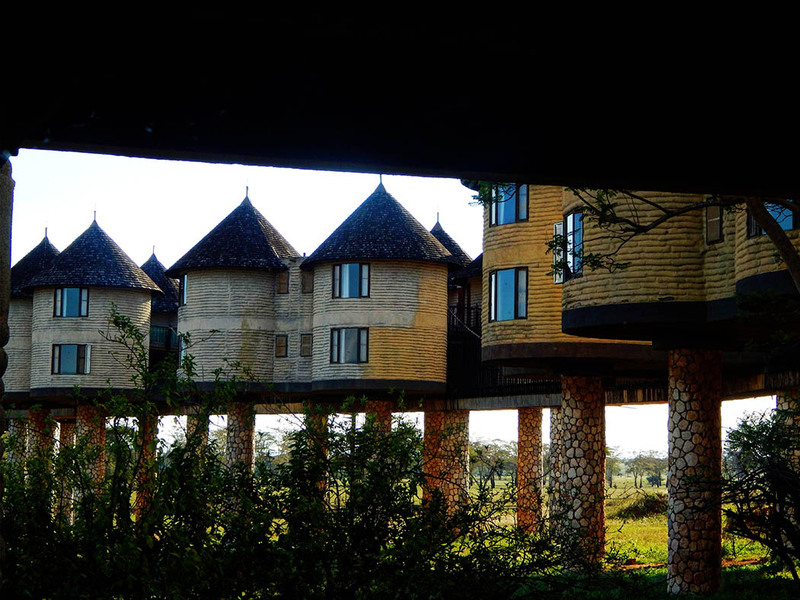 I love the way the Sarova Salt Lick game lodge looks. What an amazing trip! Use Your City: Lauren’s Raleigh | Used York City | The best of NY, as used by NYers. Stunningly beautiful! Saroba Salk Lick game lodge is definitely on my list now as is this beautiful wildlife sanctuary…after we are done with Oceania next two years, Africa beckons 🙂 Would love to visit here.. I am sure you will enjoy yourselves.